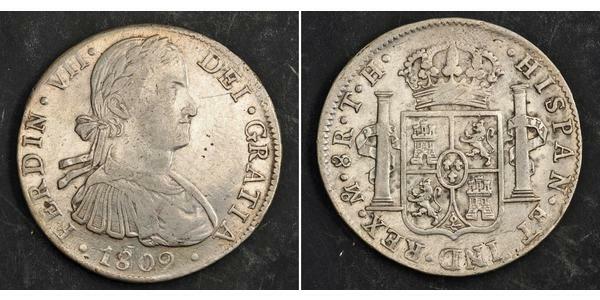 1809, Mexico, Ferdinand VII. 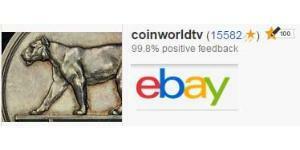 Spanish Colonial Silver 8 Reales Coin. Millitary Bust! 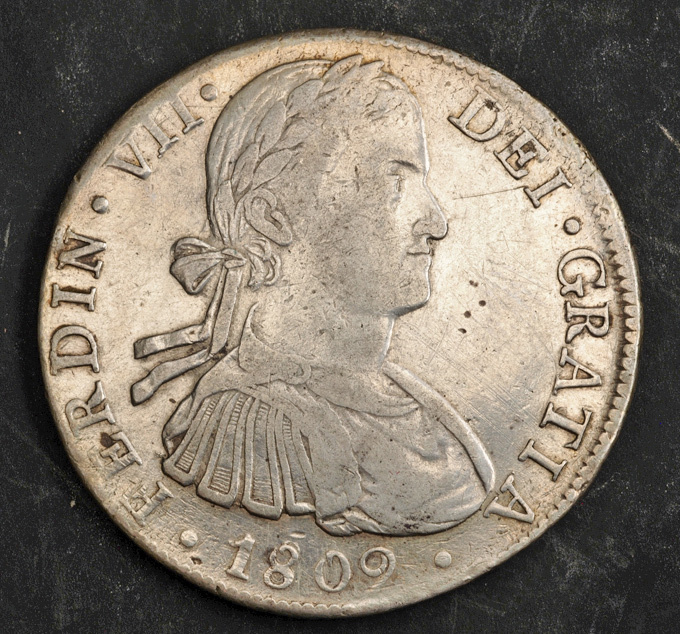 Obverse: Laureate, armoured and togate profile bust of Ferdinand VII right. Latin Legend: FERDIN . VII . DEI . GRATIA . 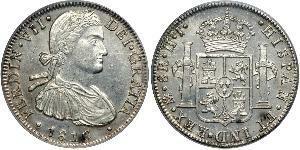 1809 Translation: "Ferdinand VII by the Grace of God, 1809"
Reverse: Crowned Spanish* arms between the Pillars of Hercules adorned with PLVS VLTRA motto. Legend: .HISPAN[IARUM].ET IND[IARUM].REX.Mo[Mexico in Monogram].8R [EALES] T.H. 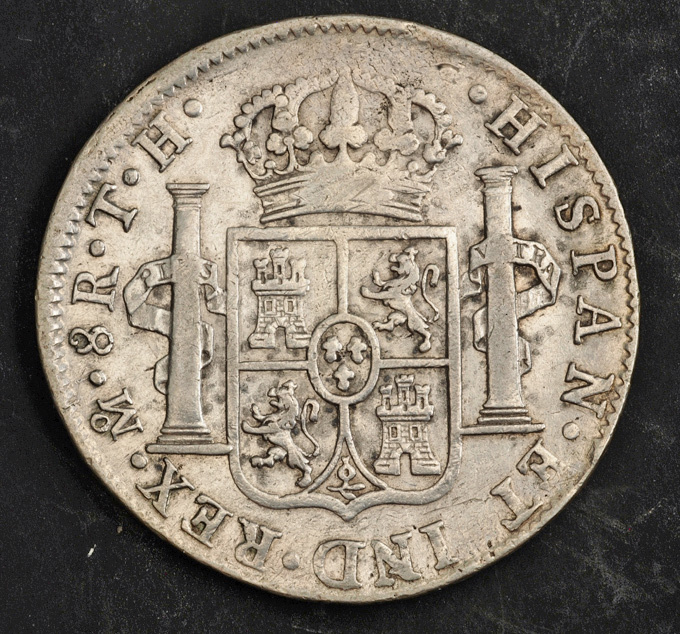 [assayer] Translation: "King of the Spains and the Indies, Mexico[Mint], 8 reales"
The Spanish dollar (also known as the piece of eight, the real de a ocho, or the eight real coin) is a silver coin, worth eight reales, that was minted in the Spanish Empire after a Spanish currency reform of 1497. It was legal tender in the United States until an Act of the United States Congress discontinued the practice in 1857. 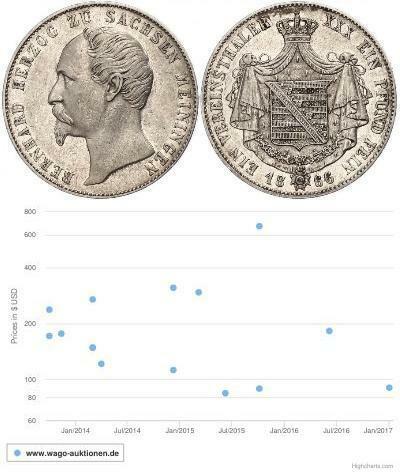 Through widespread use in Europe, the Americas and the Far East, it became the first world currency by the late 18th century. 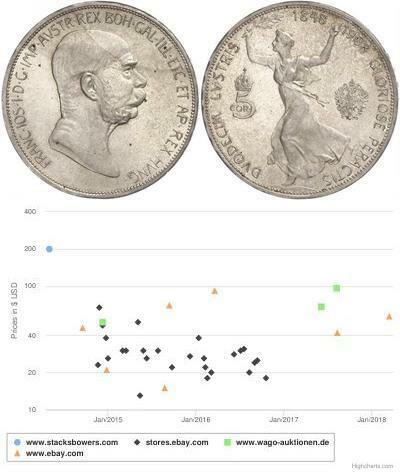 Many existing currencies, such as the Canadian dollar, United States dollar and the Chinese yuan, as well as currencies in Latin America and the Philippines peso were initially based on the Spanish dollar and other 8 reales coins. *Details on the Spanish Arms: arms of Castile and León, with Granada in base and an inescutcheon of Anjou. Ferdinand VII (October 14, 1784 - September 29, 1833) was King of Spain from 1813 to 1833. The eldest son of Charles IV, king of Spain, and of his wife Maria Louisa of Parma, he was born in the vast palace of El Escorial near Madrid. When his father's abdication was extorted by a popular riot at Aranjuez in March 1808, he ascended the throne but turned again to Napoleon, in the hope that the emperor would support him. He was in his turn forced to make an abdication and imprisoned in France for almost seven years at the Chateau of Valençay in the town of Valençay. In March 1814 the Allies returned him to Madrid. The Spanish people, blaming the liberal, enlightened policies of the Francophiles (afrancesados) for incurring the Napoleonic occupation and the Peninsular War, at first welcomed Fernando. Ferdinand soon found that while Spain was fighting for independence in his name and while in his name juntas had governed in Spanish America, a new world had been born of foreign invasion and domestic revolution. Spain was no longer an absolute monarchy under the liberal Constitution of 1812. Ferdinand, in being restored to the throne, guaranteed the liberals that he would govern on the basis of the existing constitution, but, encouraged by conservatives backed by the Church hierarchy, he rejected the constitution within weeks (May 4) and arrested the liberal leaders (May 10), justifying his actions as rejecting a constitution made by the Cortes in his absence and without his consent. Thus he had come back to assert the Bourbon doctrine that the sovereign authority resided in his person only. After he succeeded to the throne in 1788 his one serious occupation was hunting. Affairs were left to be directed by his wife and her lover Manuel de Godoy. Although Godoy essentially took over his wife and his office, the king was favourable towards him for all his life. When terrified by the French Revolution he turned to the Inquisition to help him against the party which would have carried the reforming policy of Charles III much further. But he never took more than a passive part in the direction of his own government. He simply obeyed the impulse given him by the queen and Godoy. In 1803, after smallpox had affected his daughter María Luísa, the king commissioned his doctor Francisco Javier de Balmis to bring the vaccine to the Spanish colonies on state expenses. He had a profound belief in his divine right and the sanctity of his person. He thought it very important to seem a very powerful monarch, although his kingdom was treated as a mere dependency by France and his throne was dominated by the queen and her lover. Spain allied with France and supported the Continental Blockade, but withdrew after the Battle of Trafalgar. When Napoleon won from Prussia in 1807, Godoy returned to the French side, but France no longer considered Spain a worthy ally. But even the alliance with France, as it was, made Godoy's rule unpopular and fueled the partido fernandista, the supporters of Ferdinand, who favored a close relationship with Great Britain.